This is “Speaking Contexts That Affect Delivery”, section 14.2 from the book Public Speaking: Practice and Ethics (v. 1.0). For details on it (including licensing), click here. Understand how the physical setting of a speech is an element that calls for preparation. Examine some tips and strategies for common speaking situations. The Reverend Dr. Martin Luther King Jr. gave his famous “I Have a Dream” speech on the steps of the Lincoln Memorial at a gigantic civil rights rally on an August afternoon in 1963. His lectern was bristling with microphones placed there for news coverage and for recording the historic event. His audience, estimated to number a quarter of a million people, extended as far as the eye could see. He was the last speaker of the day, delivering his speech after more than a dozen civil rights leaders and world-famous performers such as Joan Baez, Mahalia Jackson, and Charlton Heston had occupied the stage.Ross, S. (2007). Civil rights march on Washington. Infoplease. Retrieved from http://www.infoplease.com/spot/marchonwashington.html King gave us his speech in the assertive ringing tones of inspired vision. Nothing less would have worked that day. Most of us will never speak to so many people at once. Even an appearance on television will probably command a much smaller audience than the crowd that heard King’s speech. Even though you don’t expect an audience of such size or a setting of such symbolic importance, you should still be prepared to adapt to the setting in which you will speak. Our audiences, circumstances, and physical contexts for public speaking will vary. At some point in your life you may run for public office or rise to a leadership role in a business or volunteer organization. Or you may be responsible for informing coworkers about a new policy, regulation, or opportunity. You may be asked to deliver remarks in the context of a worship service, wedding, or funeral. You may be asked to introduce a keynote speaker or simply to make an important announcement in some context. Sometimes you will speak in a familiar environment, while at other times you may be faced with an unfamiliar location and very little time to get used to speaking with a microphone. These are contexts and situations we address in the following subsections. A lecternA small raised surface, usually with a slanted top, where a speaker can place his or her notes during a speech. is a small raised surface, usually with a slanted top, where a speaker can place notes during a speech. While a lectern adds a measure of formality to the speaking situation, it allows speakers the freedom to do two things: to come out from behind the lectern to establish more immediate contact with the audience and to use both hands for gestures. However, for new speakers who feel anxious, it is all too tempting to grip the edges of the lectern with both hands for security. You might even wish you could hide behind it. Be aware of these temptations so you can manage them effectively and present yourself to your audience in a manner they will perceive as confident. One way to achieve this is by limiting your use of the lectern to simply a place to rest your notes. Try stepping to the side or front of the lectern when speaking with free hands, only occasionally standing at the lectern to consult your notes. This will enhance your eye contact as well as free up your hands for gesturing. 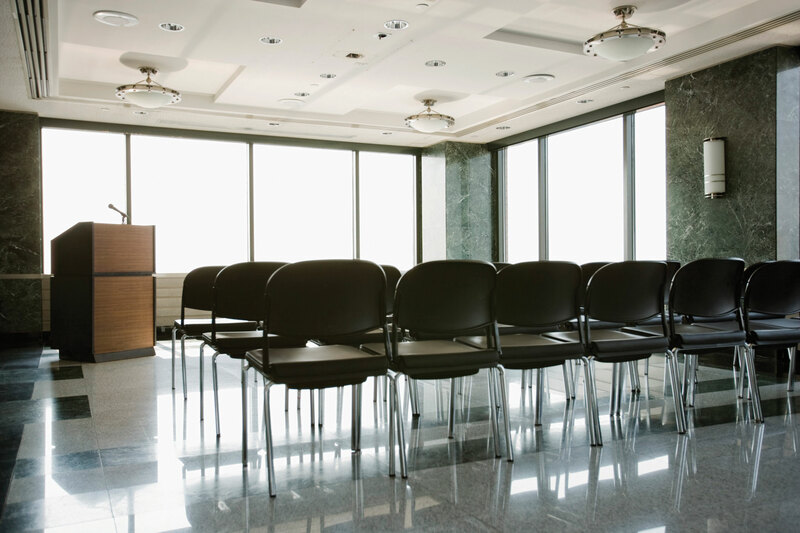 If you are accustomed to being in a classroom of a certain size, you will need to make adjustments when speaking in a smaller or larger space than what you are used to. A large auditorium can be intimidating, especially for speakers who feel shy and “exposed” when facing an audience. However, the maxim that “proper preparation prevents poor performance” is just as true here as anywhere. If you have prepared and practiced well, you can approach a large-venue speaking engagement with confidence. In terms of practical adjustments, be aware that your voice is likely to echo, so you will want to speak more slowly than usual and make use of pauses to mark the ends of phrases and sentences. Similarly, your facial expressions and gestures should be larger so that they are visible from farther away. If you are using visual aids, they need to be large enough to be visible from the back of the auditorium. Limited space is not as disconcerting for most speakers as enormous space, but it has the advantage of minimizing the tendency to pace back and forth while you speak. We have all seen dramatic soliloquies in the movies and plays where an actor makes use of the space on the stage, but this is generally not a good strategy for a speech. A small space also calls for more careful management of notecards and visual aids, as your audience will be able to see up close what you are doing with your hands. Do your best to minimize fumbling, including setting up in advance or arriving early to decide how to organize your materials in the physical space. We will discuss visual aids further in Chapter 15 "Presentation Aids: Design and Usage". Outdoor settings can be charming, but they are prone to distractions. If you’re giving a speech in a setting that is picturesquely beautiful, it may be difficult to maintain the audience’s attention. If you know this ahead of time, you might plan your speech to focus more on mood than information and perhaps to make reference to the lovely view. More typically, outdoor speech venues can pose challenges with weather, sun glare, and uninvited guests, such as ants and pigeons. If the venue is located near a busy highway, it might be difficult to make yourself heard over the ambient noise. You might lack the usual accommodations, such as a lectern or table. Whatever the situation, you will need to use your best efforts to project your voice clearly without sounding like you’re yelling. Most people today are familiar with microphones that are built into video recorders and other electronic devices, but they may be new at using a microphone to deliver a speech. One overall principle to remember is that a microphone only amplifies, it does not clarify. If you are not enunciating clearly, the microphone will merely enable your audience to hear amplified mumbling. Microphones come in a wide range of styles and sizes. Generally, the easiest microphone to use is the clip-on style worn on the front of your shirt. If you look closely at many television personalities and news anchors, you will notice these tiny microphones clipped to their clothing. They require very little adaptation. You simply have to avoid looking down—at your notes, for instance—because your voice will be amplified when you do so. Lectern and handheld microphones require more adaptation. If they’re too close to your mouth, they can screech. If they’re too far away, they might not pick up your voice. Some microphones are directional, meaning that they are only effective when you speak directly into them. If there is any opportunity to do so, ask for tips about how to use a particular microphone and practice with it for a few minutes while you have someone listen from a middle row in the audience and signal whether you can be heard well. The best plan, of course, would be to have access to the microphone for practice ahead of the speaking date. Often a microphone is provided when it isn’t necessary. If the room is small or the audience is close to you, do not feel obligated to use the microphone. Sometimes an amplified voice can feel less natural and less compelling than a direct voice. However, if you forgo the microphone, make sure to speak loudly enough for all audience members to hear you—not just those in front. A small audience is an opportunity for a more intimate, minimally formal tone. If your audience has only eight to twelve people, you can generate greater audience contact. Make use of all the preparation you have done. You do not have to revamp your speech just because the audience is small. When the presentation is over, there will most likely be opportunities to answer questions and have individual contact with your listeners. Your classroom audience may be as many as twenty to thirty students. The format for an audience of this size is still formal but conversational. Depending on how your instructor structures the class, you may or may not be asked to leave time after your speech for questions and answers. Some audiences are much larger. If you have an audience that fills an auditorium, or if you have an auditorium with only a few people in it, you still have a clearly formal task, and you should be guided as much as possible by your preparation. Not every speaking setting happens in a classroom. As such, different environments call for speakers to think through their basic speaking strategies. Speakers need to be prepared to deal with five common challenges in speaking contexts: using a lectern, large or small space, speaking in the outdoors, using a microphone, and audience size. Get permission from your instructor and announce a campus event to the class. Make sure your details are complete and accurate. How does your physical space affect the way you present the information? Watch a speech that takes place indoors or outside. How do you think this speech would be different if the speech occurred in the other location? What changes would you recommend for the speaker? If you were suddenly asked to give your next classroom speech in front of two hundred of your peers, how would adjust your speech? Why?